This effort started by happenstance and with a meeting my wife Caroline had with George Barton Jr.'s wife Barbara. She was kind enough to supply materials to us that started this inquiry. A visit to Consolation House also yielded results with the owners (at that time) looking to have the occupational therapy community have possession of some additional ephemera. 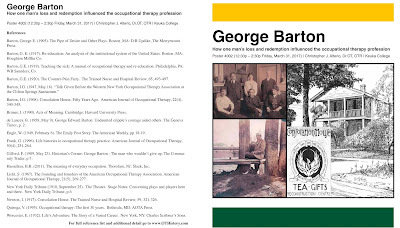 We accepted these materials with the promise to use them for study and for advancing the biography of George Barton which has previously not been fully highlighted. Over the last several years I have combined those materials with other biographical research and began constructing blog posts that are now catalogued under the www.OTHistory.com site. 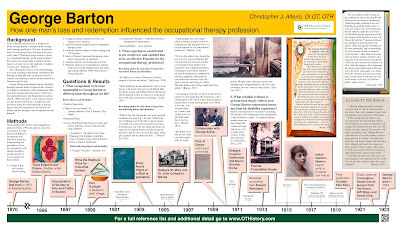 Over the last year it has been my pleasure to find new friends in Clifton Springs who were planning a 100th anniversary celebration of the occupational therapy founding that occurred in their community. I am especially indebted to the kind folk associated with the Clifton Springs Chamber of Commerce, the Clifton Springs Historical Society, various community members who are participating on their planning committee, and also some local educators who represent regional occupational therapy programs. 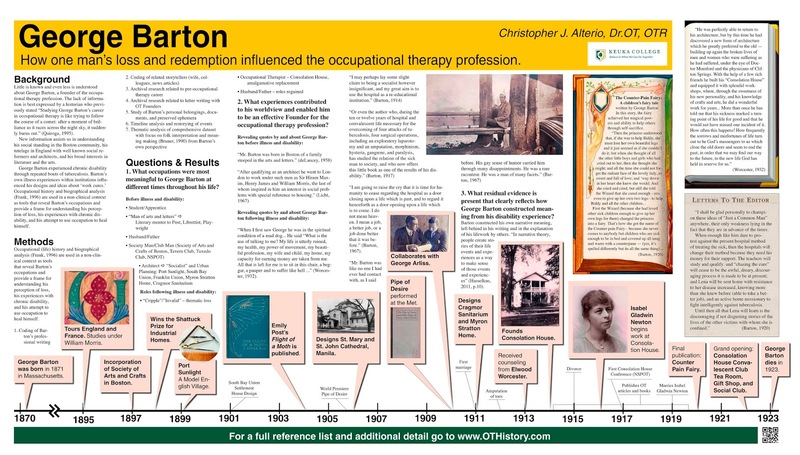 Some of the information obtained through this ongoing project will also be presented on June 3rd, 2017 during the Sulphur Springs Festival that will feature an occupational therapy centennial celebration. 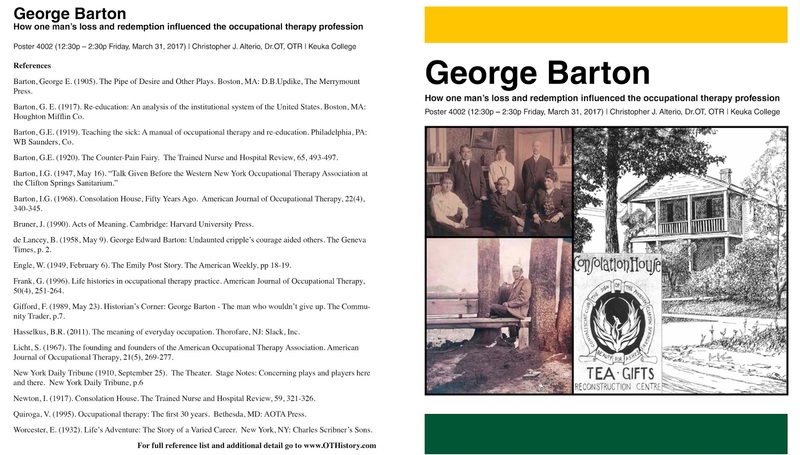 I hope occupational therapists enjoy looking at these pictures and also enjoy looking through the blog and learning more about the history of their profession. Use the www.OTHistory.com address to navigate to the site, and use the 'Barton' and 'History' links on the blog to find more information. Many more detailed references can be found at the end of each blog post.